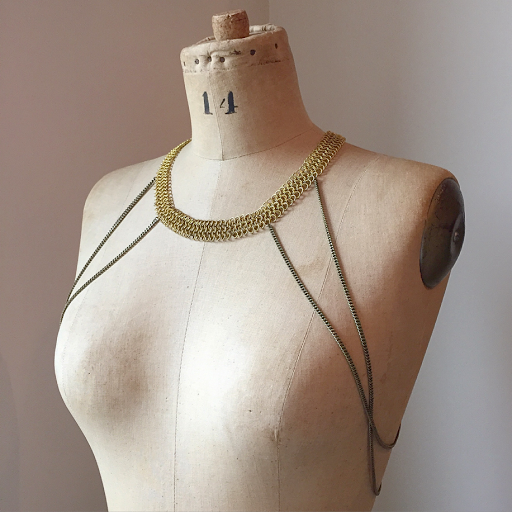 #tbt to earlier this week when I sent out the last ever Hera Broad Collar Body Chain with a mix of joy and sadness. I feel strongly about offering short runs and limited editions of designs to add their uniqueness. Many of my designs include vintage materials, available only in limited quantities, which add to what makes them special. With all of the mass production in today's world I think there's something really wonderful about having something that only a few others in the world will have. A striking statement piece would be much less striking if it had been seen on a hundred people before. I truly love making unique pieces of jewelry, hand made with love and thoughtfully chosen materials. That being said, it still feels bitter sweet whenever I send out the last of any design. I love all of my creations deeply and saying goodbye to them is always a little sad, but much less sad than I'd be if I were selling mass produced dispassionate jewelry. Vote for Dolorous in the Etsy Awards!